Mentioned in the Yoga Sutras of Patanjali, the eight limbs of yoga is a systematic and practical set of yogic knowledge divided into eight basic parts, thus the 8 limbs of yoga. The Eight limbs of yoga are also known as Ashtanga yoga. Patanjali Yoga Sutras being the most famous and most practiced philosophy of yoga and ‘Ashtanga Yoga’ being the core of it, knowing, understanding and practicing the eight limbs of yoga is a must for any yogi. The simultaneous practice of the yoga prepares your body and mind in a multidimensional approach to eventually reach the ultimate, enlightenment. The 196 Sutras of Patanjali Yoga Sutras are divided into four chapters or padas. The practice of the 8 limbs of yoga comes from the second chapter known as the ‘Sadhana Pada’. Ashtanga which means ‘eight’ refers to Patanjali’s eight limbs or branches of yoga. The main purpose of this beautiful knowledge is to make the principles and practices of the Yoga formulae more understandable and practical for all. 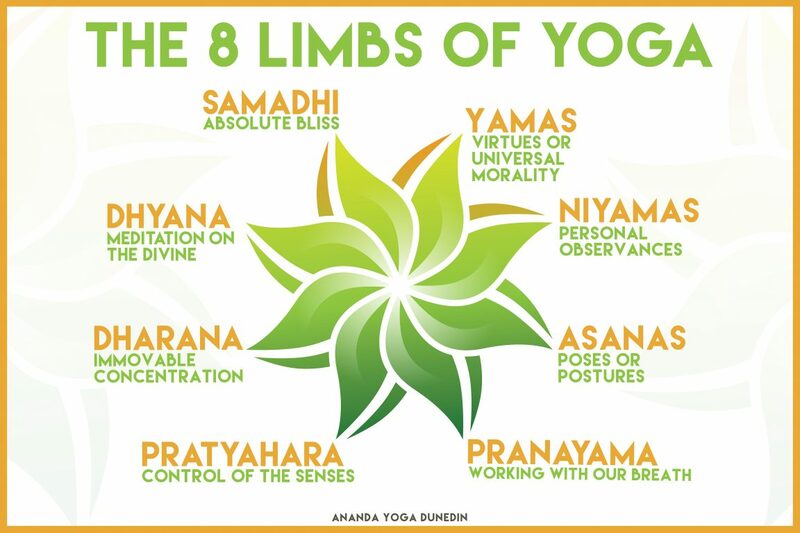 The 8 limbs are the essence of yoga, and from it, various schools of practice were born with time. The vast wealth of yoga knowledge was passed down from teacher to student and eventually branched out into many types and forms. Patanjali in his book ‘Yoga Sutras’ talks about the ‘Eight Limbs Of Yoga’ called the Ashtanga Yoga explained briefly in the following text. Asana is the physical practice of yoga, which is also commonly known as the yoga postures. Yet, asana is not just a simple exercise. It is a physical medium through which we can keep the mind calm and balanced. There is this very beautiful quote on asana by Patanjali, “Sthira sukham asanam“, which means, “That which is steady and which is comfortable is asana”. In a deeper scenario, Asana extends our comfort level by shifting even our uncomfortable zone into a pleasant one. Life is full of possibilities where anything can happen and smaller your comfort zone, there is more that you are uncomfortable with. Thus, life being vast, yet one being comfortable only in a limited sphere brings more misery. The university exists in duality due to which there are always ups and downs in life. Asana is that which enables us to maintain the equanimity. Asana is a practice to find comfort and stability in any kind of posture. In a way, it is the medium to train the mind to be stable or balanced through body postures. Prana is the life force, the vital energy needed by our physical and subtle layers, for us to survive. It is said that life force energy flows through thousands of subtle energy channels called the ‘Nadis’ (energy channels) and energy centers (junctions of those Nadis) called ‘Chakras’. It is very important that a good quantity and quality of prana flows through the Nadis and chakras as it determines one’s state of mind. Similar to a vehicle, where having a good flow and quality of gas gives a better performance. Having a continuous, smooth, steady flow and high level of prana keeps the mind calm, positive and enthusiastic. However, just like how a vehicle’s performance deteriorates with its continuous usage, time and other conditions, so does our mind. Ensuing, even our mind needs some sort of servicing just like a vehicle to keep it in its best form. As it is the prana or life force in us that nourishes the mind and keeps the body alive, Pranayam is one of the best ways to service our mind. ‘Prana’ refers to the universal life force and ‘Ayama’ means to regulate or lengthen. Pranayam is a yogic way of breathing to increase our prana. Thus, with the help of breath, the process or practice increases and enhance the quantity and quality of prana and clearing the blockages in Nadis and chakras. As a result making one more energetic, enthusiastic, positive and have a good state of mind. Pratyahara is the aware full interiorization of one’s senses. The nature of our senses is to flow outwards. For instance, everything we see, hear, touch, taste, and smell is something happening outside of us. As a result, even our energy that goes into the senses goes outwards. Thus, Pratyahara is the conscious process of turning our attention and thoughts inwards by withdrawing our energy from the senses. Dhyana is the practice of meditation, which is the art of doing nothing. The state of meditation is beautiful and amazing where we are both in deep rest and awareness at the same time. More so, the rest in meditation is said to be deeper than the deepest sleep. A calm mind, good concentration, clarity of perception, improvement in communication, inner strength, and relaxation are all natural results of meditating regularly. In today’s world where stress catches on faster than the eye can see or the mind can perceive, meditation is no more a luxury. It is a necessity. Meditation is a gift for the humankind holds the power to unconditional happiness and peace of mind. Samadhi the blissful state of existence that is even believed to be beyond mind, ‘Dharana’ and meditation. It is believed to be so beautiful that you slip into a transcendental state where the feeling of ‘I’ (the ego) is absent. In a meditation, memory is still awake but in the state of samadhi, we become free from the clutches of memory. Thus, Samadhi is the main technique that the yogis learn to dive deeper into the self. Samadhi is the state of oneness, where there is no distinction, between the actor of meditation, the act of meditation and the subject of meditation. Samadhi is that spiritual state when one is so absorbed in whatever it is contemplating on, that the mind dissolves the sense of its own identity into the higher identity. The thinker, the thought process and the thought fuse with the subject of thought. There is only oneness in samadhi, which happens through sustained practice of yoga. The eight limbs of yoga support one another, but their progression isn’t meant to be rigid. For example, someone might begin the practice of an asana before they have mastered Niyama, still, they must follow the overall elements of the 8 limbs to have a wholesome growth. Through the Yoga Sutras, Patanjali has provided the highest knowledge to reach the ultimate. Thus, Ashtanga Yoga is the core of the Patanjali Yoga Sutras, thus, standing tall as one of the best and the most practiced forms of yoga even today.